It was Valentines Day 1996. I was in charge of delivering roses and bouquets to the students in our school because I came up with this fantastic idea of selling them to raise funds for our Science Club. Yes, I was an officer for the Science Club. I got to the school at 630 am and by 730am, I was dead tired. 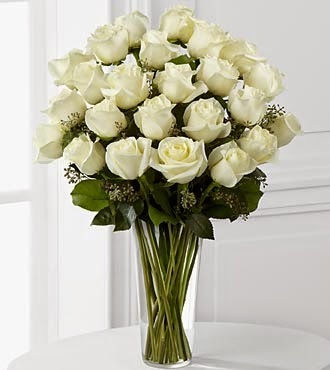 Soon as I got to my classroom, I saw a huge bouquet of white roses and thought, "seriously? I still need to deliver one more? Well, whoever she is, she can wait!" I proceeded to dump the bouquet on an empty seat beside me and ignored it for the next 2 hours. When break came, my then first boyfriend went to my class with a huge, expectant smile on his face which soon turned into a frown when he saw the bouquet. He asked me, "did you not like it?" I was confused and replied, "liked what?" Apparently, the bouquet that I thought I was going to deliver was for me. I didn't read the card because I didn't see it and it had my name on it. So much for my first bouquet of roses. I simply dumped it on an empty chair. Haha. PS. I gave this to my Mom. I prefer Gerbera and Stargazers.